Unlike the Toyota Etios compact-sedan which received moderate response, the bigger Toyota Vios seems to have the right mix to become a runaway success, provided the mid-sized sedan is priced smartly in India. The new Toyota Vios sedan employs Toyota’s latest design language; something which is also seen on the larger and much sought-after Corolla Altis. It’s clearly more aggressively styled than the subdued Toyota sedans of yesteryears. Unlike other Japanese sedans in the segment like the Honda City and Maruti Ciaz, which have similar styling and profile, the Vios has a very distinct design. The front is wide and low, giving it an aggressive stance. The prominent chrome strip on the sleek grille, a set of upswept head lights and a large hexagonal airdam adds to the sporty scheme. The side profile and rear design is equally appealing with a prominent shoulder line and sharp design of the tail lamps. Moreover, Toyota Vios’ fresh design will also prompt many mid-size sedan buyers to opt for this new Japanese offering. Even in terms of size and proportion, the new Toyota Vios seems to be slotted right in the middle of the segment, if we consider the dimensions of the international car. Though it has the shortest wheelbase of 2550mm, at 4410mm, the Vios is longer than Hyundai Verna and Volkswagen Vento. In fact, at 1700mm, the Toyota is also wider than the Honda City and VW Vento; and having 1475mm height the Vios is taller than the VW Vento. 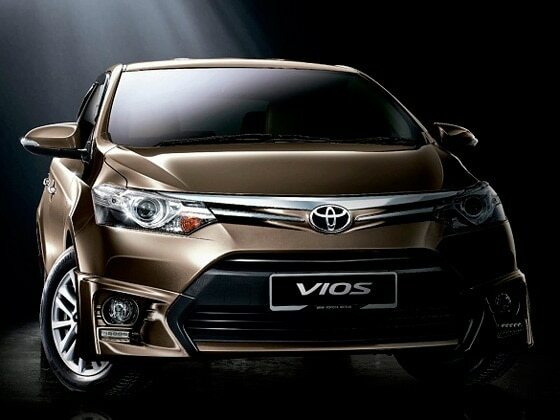 The Indian version of the new Toyota Vios is expected to carry a dual tone — black and beige dashboard. The interiors resemble the one seen on its elder sibling Toyota Corolla Altis, which isn’t a bad thing. The cabin is said to have plenty of smart storage space and cubby holes, including useable door pockets. Apart from a basic music system, the new Toyota Vios could also sport a touchscreen infotainment system and automatic gearbox option on the top-of-the-line variants. Toyota has not given its car buyer an opportunity to complain about the interior quality so far, the only exception being the mundane design of the Toyota Etios, which was built for the price tag it carried. This is one thing TKM will be careful not to repeat with any of its future products, and will be extra cautious to offer the new Toyota Vios with top class quality, materials and finish. Going by the current range of Toyota cars like the new Corolla Altis and Innova, we expect the seats of the Toyota Vios to offer good lumbar support and cushioning. With smart space utilisation, the Vios is also expected to offer good rear seat kneeroom. The Toyota Corolla Altis has been a benchmark in terms of ride quality and passenger comfort, and TKM will surely fine tune the suspension and tyre options of the Vios in a similar fashion, to make it compatible with the Indian road condition. Toyota is expected to offer the new Vios mid-size sedan with a petrol and diesel engine option in India. The 1.5-litre petrol motor is expected to be borrowed from the Etios compact sedan, while the 1.4-litre D-4D diesel engine which powers the Corolla Altis will also do the duty on the Vios. These are a reliable set of engine that are strong enough to keep competition at bay, and have a respectable fuel economy of close to 15kmpl for the petrol and 20kmpl for the diesel variant. The strongest attribute Toyota has in India and internationally is its reliable car models, hassle free maintenance and low cost of running. Over the years Toyota Kirloskar Motor has been successful in maintaining this brand image by providing one of the best after sales services and customer support. This is one of the main reason why a Toyota Corolla or Innova buyer, does not hesitate buying the new iterations of these models when they are looking at upgrading their cars. This will be an important factor which will help the new Toyota Vios garner better sales. Toyota is well aware of the cut-throat competition its new mid-size sedan will have to face in this segment. Hopefully it will use its learning from cars like the Toyota Etios and Liva in terms of low cost of production on the upcoming Toyota Vios. Pricing will be key, and if TKM manages to price the new Vios aggressively between Rs 7 lakh and Rs 10 lakh, then its traditional rivals will have another reason for sleepless nights.